& long-lasting concrete landscape borders. We are family owned & operated. L&B'S Concrete Landscape Borders specializes in adding value and beauty to Colorado homes and businesses through quality concrete edging. 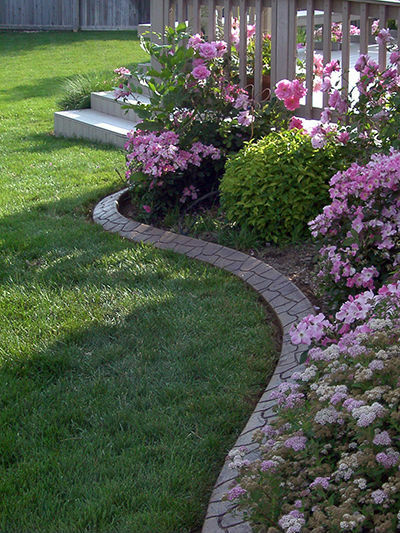 Concrete landscape borders are an attractive and durable investment in your property that will last for years to come. All finishing touches are made under the supervision of the company owner, ensuring the high standard of workmanship that L&B is known for. We are centrally located and based in Denver, which means we do work from Ft. Collins to Colorado Springs . Our services vary to fit the needs of your unique project. We can replace dangerous rusted metal edging with stamped concrete, install rebar in your concrete or provide much-needed accents curbing to your landscape. Beautiful aesthetics and functionality is a positive investment for your home. Decorative concrete borders enhance the and accent lawns and driveways. Distinguishing barriers for car parking curbs, flower beds, mower edges and playgrounds provide visible and appealing sections of your overall landscape. Your distinct curb appeal can be designed with unique decorative borders, colored border edges or stamped borders. Concrete curbing is a modern staple in landscaping design for both residential and commercial properties. There are countless ways to use concrete borders to achieve the curb appeal you have been looking for. Contact L&B Concrete Landscape Borders to enhance the beauty and value of your property through functional, aesthetic design. Contact us today for your FREE estimate on concrete curbing.